Hi, this might be a silly question but I have a field called [AREA] that has 3 values. One of these is 'UK'. I wanted to change the values from 'UK' to 'DDMS' so created a calculation to do this. In the query I I did a test and selected a few records that were UK and these correctly appeared as DDMS. However when I do a reload 'UK' remains. How do I change this value so all views of the data analysis remain with three categories to select upon? Use the DataManager Operations block called Search and Replace instead of a formula and place it between the Excel source file Import block and the loaded, in-memory blue Omniscope block. 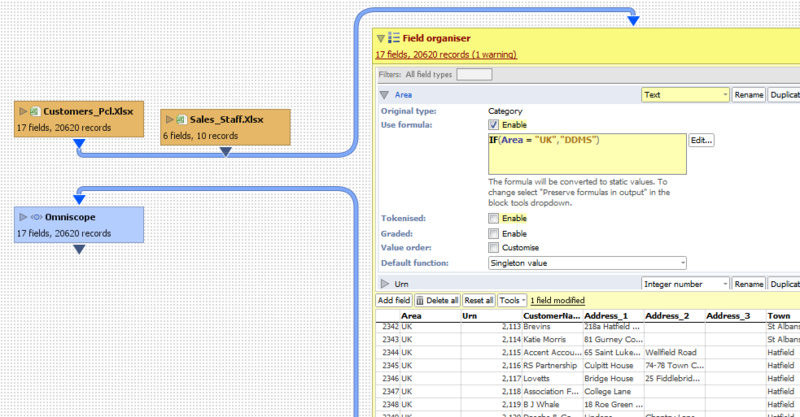 You just have to set the block to search within the [Area] field and automatically replace all values "UK" with "DDMS".